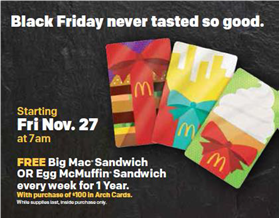 McDonalds has for Black Friday 11/27/15 starting at 7am - A Free Big Mac or Egg McMuffin every week for 1 year with purchase of $100 in Arch gift cards. While Supplies Last. At participating locations only. Check with your local location to see if they are participating.